This timely collection asks the reader to consider how society’s modern notion of humans as rational, isolated individuals has contributed to psychological and social problems and oppressive power structures. Experts from a range of disciplines offer a complex understanding of how humans are shaped by history, tradition, and institutions. Drawing upon the work of Lacan, Fanon, and Foucault, this text examines cultural memory, modern ideas of race and gender, the roles of symbolism and mythology, and neoliberalism’s impact on psychology. Through clinical vignettes and suggested applications, it demonstrates significant alternatives to the isolated individualism of Western philosophy and psychology. This interdisciplinary volume is essential reading for clinicians and anyone looking to augment their understanding of how human beings are shaped by the societies they inhabit. David Goodman, PhD is interim dean at the Woods College of Advancing Studies at Boston College, associate professor of the Practice in the Philosophy department, director of Psychology and the Other, and a teaching associate at Harvard Medical School/Cambridge Hospital. Eric Severson, PhD is author of the books Levinas's Philosophy of Time, Scandalous Obligation, and the editor of seven other volumes. He lives in Kenmore, Washington with his wife Misha and their three children, and teaches philosophy at Seattle University. Heather Macdonald, PhD scholarly research focuses on the interface between relational ethics, and clinical practice. Her first monograph, titled Cultural and Critical Explorations in Community Psychology, further considers the implications of psychological assessment and historical trauma. "This book is a tour de force, a timely and urgent collection of essays by scholars at the very forefront of the intersection of the psychology and the political. Topics both contemporary and historical – race, otherness, trauma, slavery, ethics, ‘whiteness’ and neoliberalism (amongst others) are addressed in ways both invigorating and original, and in manner which changes how we think the role and pertinence of the psychological in the contemporary world." "Editors Goodman, Severson, and Macdonald have brought together a brilliant group of writers to discuss and illuminate American struggles with race, sexism, and classism. In this dark time, when the forces of hate and destructiveness threaten to run rampant world-wide, we need the deeply insightful, creative, and hopeful investigations provided by this volume. The interdisciplinary collection provides us with psychological, philosophical, political perspectives about some of the most wrenching dilemmas of our time. The country, the world, needs this book." "David Goodman, Eric Severson and Heather Macdonald have put together a comprehensive resource that addresses the manifold challenges we face when confronting otherness—in all of its philosophical, psychological, and theological complexities. 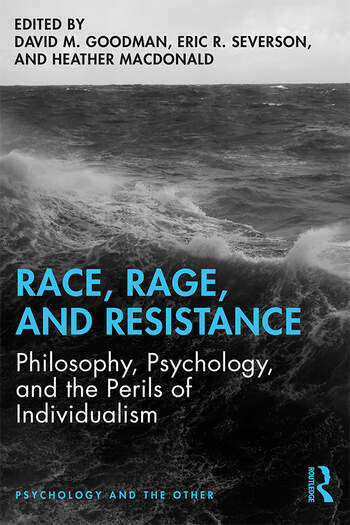 Race, Rage and Resistance does so by bringing into conversation a diverse group of scholars who underscore the manifest and latent ways that theories and practices of oppression keep us from forming and sustaining genuine community. Collectively, this volume of essays reinvigorates what the wisdom of the past, whether from Fanon, Freud, Lacan or Levinas, has to say about the urgent challenges of alterity we face today." "These thinkers are utterly determined to jar us out of any tired tropes about race, human relating, and history. The reader cannot help but be shaken and enlivened by the depth and reach of these ideas. Every philosopher, historian, psychoanalyst, academic, and humanitarian would do well to take on the challenge of engaging this work because these authors are fearless. They will march you into surprisingly dark and light-filled spaces."